The cholera outbreak in Yemen has now become the worst in the world, the United Nations says. The disease is spreading at a rate of 5,000 new cases a day, forcing the total number suffering from the killer illness to reach more than 200,000. So far, 1,300 have died including around 300 children, but the number who have died is expected to rise. UN agencies say the outbreak is a direct consequence of a civil war that has been ravaging the country for several years. Some rights groups have criticised countries like Saudi Arabia and Iran for supporting the groups taking part in the conflict. Under secretary-general for humanitarian affairs and emergency relief co-ordinator Stephen O'Brien said: "This is because of conflict, it's man-made, it's very severe, the numbers are absolutely staggering, it's getting worse, and the cholera element in addition to all the lack of food, the lack of medical supplies for people - one has to put that at the door of all the parties to the conflict. "And so, be that the parties on the ground or their proxies, they all have to recognise that there's a shared responsibility for causing a man-made humanitarian catastrophe, which is where we are in Yemen at the moment." UNICEF's executive director Anthony Lake added: "UNICEF and WHO are taking all measures to scale up prevention and treatment interventions. "We call on authorities in Yemen to strengthen their internal efforts to stop the outbreak from spreading further. 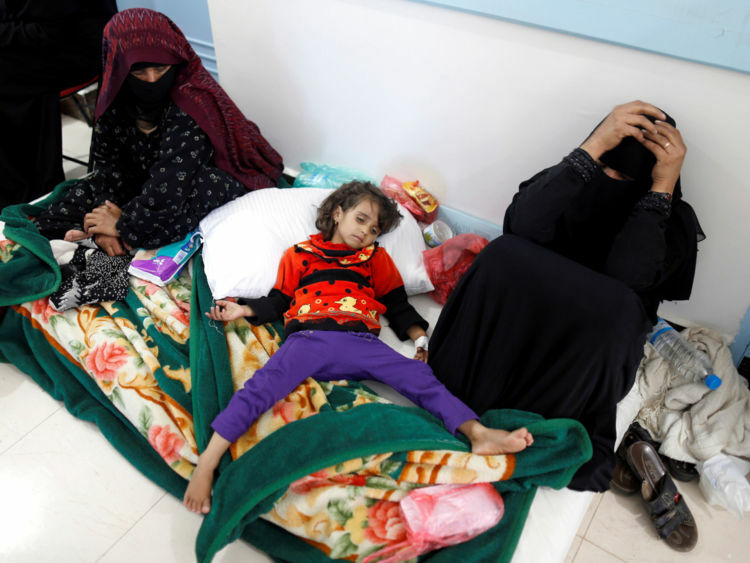 "This deadly cholera outbreak is the direct consequence of two years of heavy conflict. "Collapsing health, water and sanitation systems have cut off 14.5 million people from regular access to clean water and sanitation, increasing the ability of the disease to spread. "An estimated 30,000 dedicated local health workers who play the largest role in ending this outbreak have not been paid their salaries for nearly 10 months. "We urge all authorities inside the country to pay these salaries and, above all, we call on all parties to end this devastating conflict."